The Clam Chowder Criteria – Jay Luker – Really? ... Wow. 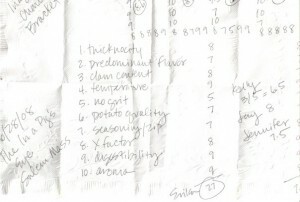 The following set of criteria is what jjzach & I use for the purposes of clam chowder quality evaluation. 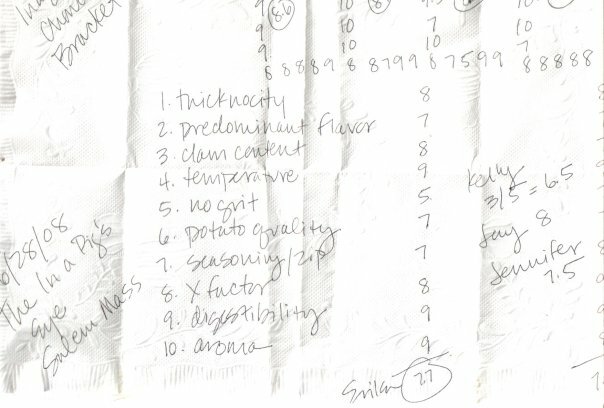 This system was devised in partnership with our friends, Kelly & Erika, on the back of a napkin about a year ago. Thicknocity – the viscosity/thickness of the chowder. Is it brothy? Creamy? Aroma – does it give off an appealing scent? Clam Content – This can hopefully be gauged by a good stir. Quality of the clams would also fall under this criterion. Flavor Balance – aka, predominant flavor. Is there one? Does it drown out everything else? *Absence of Grit *– clams live in sandy muck. Proper cleaning is required. Some tasters find a modicum of grit acceptable and see it as a sign of homemade-ness. *Digestibility *– how do you feel afterwards? How about 45 minutes into the ride home in the backseat? These are mostly subjective measurements, of course. Some folks, for example, like their chowder thick and creamy and might rate highly a variation in which their spoon stands up in the cup. Needless to say, others would give that a very low Thicknocity score.